Gold prices tried to regain momentum Wednesday as physical buyers stepped in to take advantage of lower prices. NEW YORK ( TheStreet ) -- Gold and silver prices regained momentum Wednesday on strong physical buying as investors took advantage of recent selloffs. Gold for June for delivery added $2 to settle at $1,455.60 an ounce at the Comex division of the New York Mercantile Exchange. The gold price has climbed to $1,463.70 while the spot gold price was adding $2.90, according to Kitco's gold index. Silver prices rose 17 cents to close at $40.23 an ounce. Gold prices had fallen 1.3% this week as broad selling struck the commodities sector, but the metal was rebounding Wednesday as investors stepped in to buy gold on a "discount." "Whenever we see a little selloff in the gold market, what's historically followed is some physical buying which has propped up the price," says Will Rhind, head of U.S. operations for ETF Securities. Rhind still thinks gold prices could hit $1,500 but that investors will have to be patient. "I like the range between $1,400 - $1,450," says Mihir Dange, trader at Arbitrage, but that on the upper end gold could trade around $1,460 an ounce. "There seems to be a lot of strife around the world, inflation concerns and gold still can't seem to rally ... so right now I would trade a little neutral to bearish." Dange doesn't think that $1,500 is off the table but that gold should have already broken that level on recent catalysts. According to the latest commitment of traders report, speculative longs in gold increased by 17,449, or 7.2%, from the last week in March to the first week in April, while short contracts grew 5,864, or 11%, pointing towards this more cautious trading outlook. The U.S. dollar index was slightly lower Wednesday but then climbed higher after President Obama's budget speech outlined $4 trillion in cuts over 12 years. Gold kept rising tentatively after the Federal Reserve released its beige book report that indicated the economy was improving across the country but there were no game changers in the report for low interest rates. 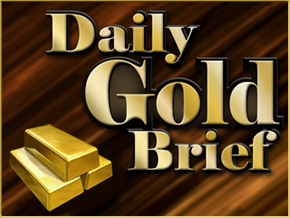 Gold will also look to Friday's inflation readings out of the U.S. and China for direction. The Federal Reserve is expected to keep rates low but China could take more steps to tighten money supply, making Friday's inflation reading key to policy initiatives. The Chinese state run newspaper reported Wednesday that China will "earnestly implement its 'prudent' monetary policy" ranging from rate hikes to higher reserve requirements. To the gold bulls, central banks will need to raise rates a tremendous amount in order to dent the bull market in gold. Peter Schiff, president of Euro Pacific, says "what's going to stop this gold bull market?" Schiff says that if the inflation rate rises faster than interest rates, then "it won't really matter to gold ... gold will keep rising." The "real inflation rate is closer to 10% than 2% ... it's as bad as the 1970's ... and it's going to get worse." When asked about gold's recent selloff as being a bearish indicator, Schiff conceded that gold will see big corrections, perhaps as big as 10%, which would pull gold down to $1,300, but that "the gold bull market will continue for a long time." The GFMS, an independent research consultancy, predicts that gold prices will hit $1,600 before the end of the year. "Investors continue to be concerned about the outlook for inflation, with governments in general showing little appetite to tighten monetary policy significantly," says chairman Philip Klapwijk. GFMS' recent gold survey said that gold investment demand drove gold higher in 2010 and should do so in 2011 along with increasing jewelry demand, as buyers become used to higher prices. World mine supply, however, pushed the global gold total to a record high with the above ground supply estimated to be around 165,600 metric tons according to the World Gold Council, but investment demand sopped up the extra supply. Another wild card for gold is the end of producer de-hedging, where miners buy gold from the market to fulfill its hedging obligation, which then in turn allows the company to sell gold at spot price. The move is a bullish indicator but the role of producer de-hedging had been instrumental in pushing gold prices higher and without it the market loses a key driver. Matthew Piggott, metals analyst with GFMS, says the end of de-hedging will force "the gold market to look to other areas of demand (such as investment) to make up the difference in the absence of price support from de-hedging activity." Gold mining stocks, a risky but potentially profitable way to buy gold, reversed directions and were mostly lower Wednesday. Kinross Gold ( KGC - Get Report) was adding 0.57% to $15.57 while Goldcorp ( GG - Get Report) was slipping 0.44% at $52.71. Other gold stocks, Agnico-Eagle ( AEM - Get Report) and Eldorado Gold ( EGO - Get Report) were trading at $64.67 and $17.58, respectively.